path. Once you experience the beauty and charm , not to mention the fun you’ll have just plain relaxing, you will have a hard time going home. 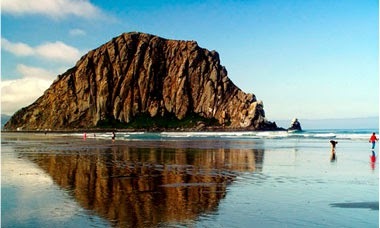 Visit the beautiful Morro Bay Rock on the beach to take in the real splendor of this town. Before you move on, be sure to stop into Fish Bonez, a new seafood restaurant in the middle of downtown Morro Bay. Fish Bonez specializes in fusion cuisine that pairs Italian, Asian and Mexican influences and merges them together with California's freshest seafood, steak, lamb, chicken as well as some of California’s best wines. But if you are really looking for a good wine, check out the hottest new wine bar on the Central Coast, STAX Wine Bar and Bistro. Choose from over 100 local and international wines. Enjoy daily tastings, and wine by the glass, as well as panini sandwiches, gourmet meats and cheese plates. Be sure to stop in for the live entertainment that they have weekly. For more information about Morro Bay, Fish Bonez or STAXWine Bar and Bistro, visit their websites.Picture courtesy of The City of Morro Bay.